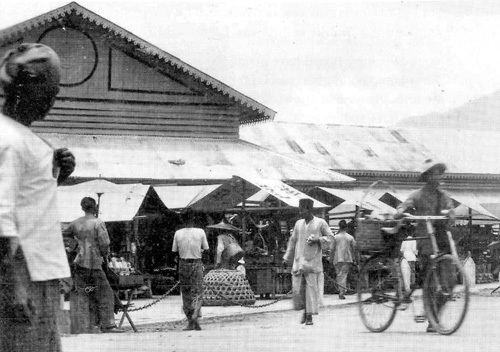 Believe it or not, the Pasar Besar in Ipoh New Town isn’t that ‘old’! This early 1900s picture (taken from the Kinta Valley book) is quite unique – has there been that much change since Towkay Yau Tet Shin built this place? I’ve noticed that those large rattan baskets are still in use today…. The rattan basket in the picture used to store live stock,but now days people mostly use the other style of rattan baskets to store vegetable only. It’s hard to find that kind of rattan baskets anymore. The circular rattan pen for chicks in the picture reminds me of my late mother who loved to rear chicken. It brings to realization how much we missed her today especially during Chinese festivals where the family could enjoy a hearty meal of the succulent home-reared chicken due to her efforts. It didn’t cross my mind then the hard work she had put in. AHLAI, it is memories like yours which make me happy that Felicia and I run this site. They make all the effort worthwhile. The original New Market is gone. It was similar in shape and size of the Taiping one, but was replaced by the concrete block that incorporates the Super Kinta Department Store. The old building you see now is only the annex to the rear of the original Market. Anyone still remember a big fire one night in the mid 1970’s that gutted part of this market? My family and I went to watch it from my aunt’s shop along Clare Street which was a stone thrown away from this market. I can’t remember exactly which year though. Anyone still remember a big fire one night in the mid 1970′s that gutted part of this market? […] I can’t remember exactly which year though. I don’t know if there was a big fire in that market in the mid-’70s, but there was one in ’65.